INDIANAPOLIS – The IUPUI Athletics Department and head basketball coach Todd Howard announced that Howard County Sports Hall of Famer Basil Mawbey has joined the staff as senior advisor. Mawbey, who won two IHSAA state championships as a coach, will begin duties immediately. Mawbey amassed a 675-259 record in a 39-year high school career that spanned seven stops. 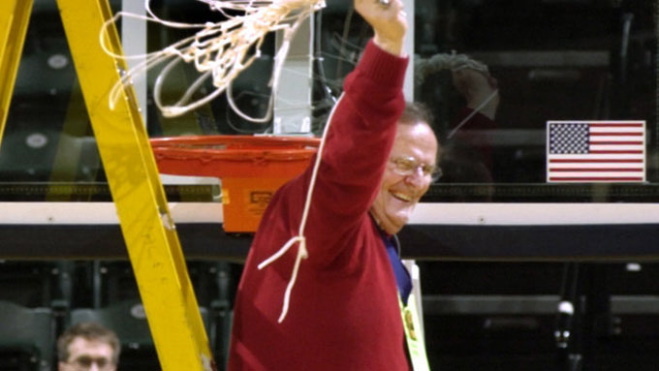 He had 33 straight winning seasons from 1977-2010 and was the 1986 Indiana All-Star head coach. He won his first IHSAA state title in 1983 at Connersville High School, and his 2003 Lewis Cass squad finished as undefeated IHSAA Class 2A state champions. At the time, it just the seventh team in state history to go unblemished. He was later Indiana’s nominee for the National Coach of the Year award. the third longest in IHSAA history. The year 2002 was particularly special for Mawbey as it was also the year he was inducted into the Indiana Basketball Hall of Fame. While at Kokomo High School, Mawbey took over for fellow Indiana Basketball and Howard County Sports Hall of Famer Carl McNulty, and after 14 seasons he left as the third winningest coach in Wildkat history with 248 wins, trailing only McNulty (256) and 1961 state championship coach Joe Platt (260). His record of 248-80 stands of the third best winning percentage (.756). He won 11 sectionals, six regionals and a pair of semi-states with Kokomo, advancing to the Final Four twice. In 1989, the Kats lost to Lawrence North in the state championship game, 74-57. In 1997, Kokomo lost to Bloomington North in the semi-final contest, 50-43, in front of 27,843 fans at the RCA Dome in the last Final Four of the one-class basketball era. In his last head coaching stop at Broad Ripple High School in 2010, he helped the Rockets to their first city championship since 1986. His coaching stops included West Washington (1970-72), Delta (1972-74), Angola (1974-79), Connersville (1979-86), Kokomo (1986-2000), Lewis Cass (2000-08) and Broad Ripple (2009-10). More than 400 of his 675 career wins came at Connersville and Kokomo. In all, he totaled 24 sectional, 11 regional and four semi-state crowns. Mawbey is the founder and director of the longest running coaches clinic in the state of Indiana, spanning more than 30 years. He’s a frequent speaker at various camps and clinics, having made more than 150 presentations, including eight in Australia. A 1964 graduate of Ball State, Mawbey’s “Basil Ball” style is widely known for its tough defensive pressure. This entry was posted in High School, IIUPUI, Kokomo. Bookmark the permalink.